My DIY hubby Tim and I have been on a roll since the first of the year. First of all, we reorganized and cleaned out the storage building where our Christmas decorations are stored. 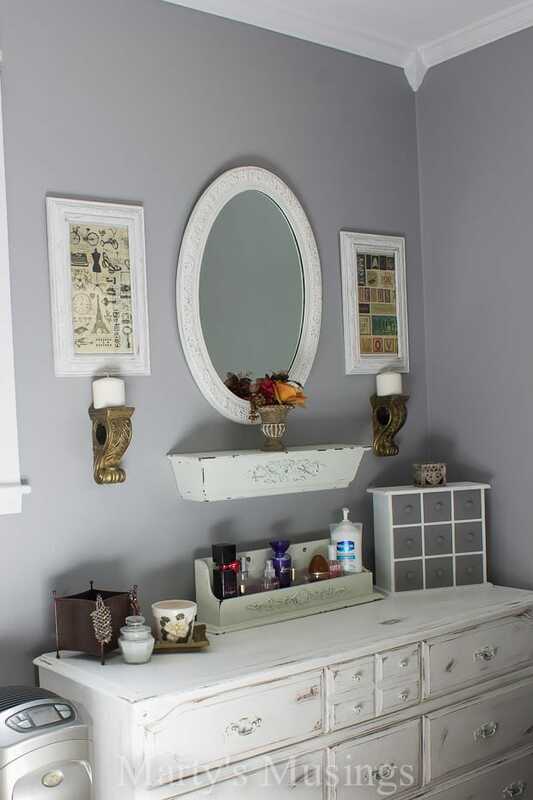 Then we (mostly me) started in on my craft room makeover (see my inspiration here). I didn’t even finish that project before we started in on our bedroom. 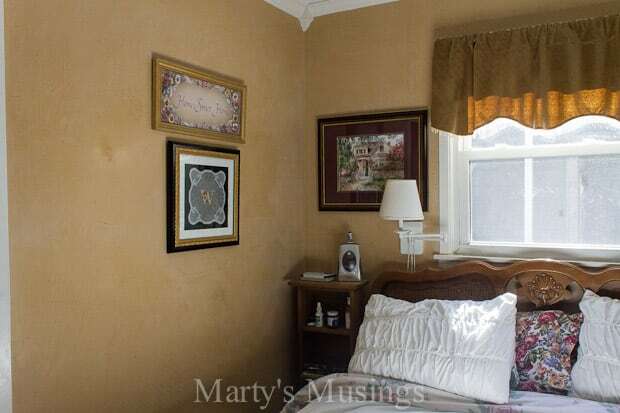 We have been in our home for 23 years and have gone from royal blue to tan to this goldish color in the master bedroom. To fully appreciate this room I have to show you a before picture. The walls were done with venetian plaster, a decorative coating system. I truly loved this paint for about five of the last ten years. It did, however, have the annoying quality of attracting dust that would create a film on top of the paint. Not good. Y’all it’s been a long five years! There’s nothing like getting snowed in to start a DIY project! 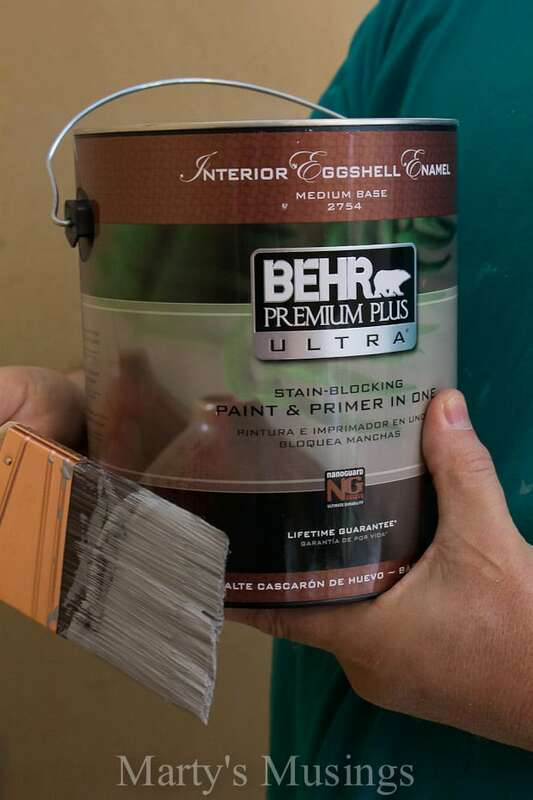 As always, we go to our trusty BEHR Premium Plus Ultra Paint for the new paint color for the bedroom makeover. It was so exciting to watch the room change before my very eyes! 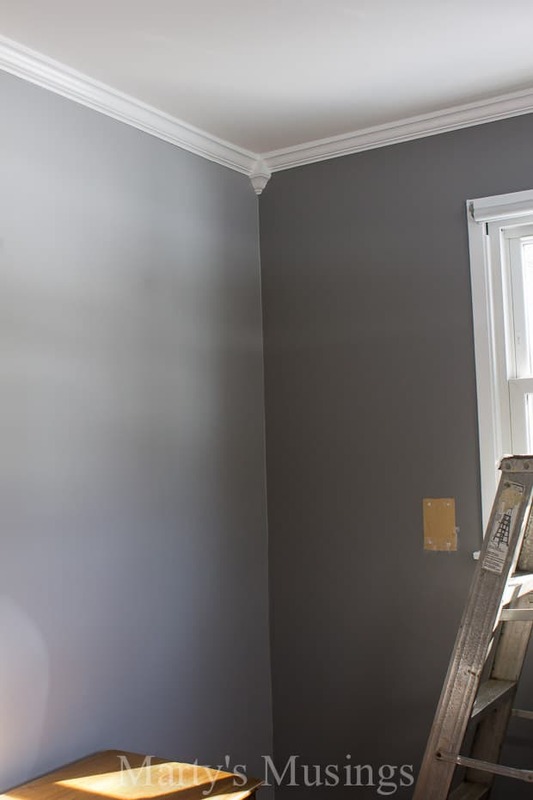 My initial idea was to use a darker shade of gray for an accent wall (similar to this one Tim did for our daughter Rachel and her husband). However, at this point I was not grooving on the accent wall. There didn’t seem to be enough distinction between the two colors. My husband does NOT like it when his beautiful paint job has a hiccup in it. Me! So at 10 pm that night we decided to try and rearrange the furniture and see if it was possible to make this small room seem bigger. Guess what? After 23 years with the furniture in the very.same.spot. we found a solution and a whole new transformation began. Alas, that did mean Tim had to repaint the accent wall to match the others. Oops. Sorry about that one. 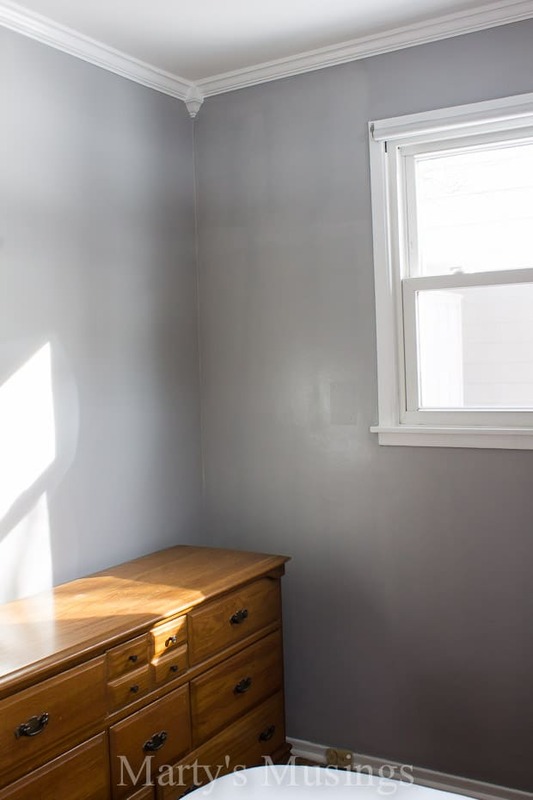 The gray looks stunning and totally changes the feel of the room. Just for a teaser, this is the look I’m going for in the rest of the room. Doesn’t the gray look amazing? There are so many projects in this makeover and I can’t wait to show the final reveal! Our BEHR DIY Expert prompt this month was to add some romance to our bedroom with a little bit of sprucing up. We obviously nailed this one, and I couldn’t be more pleased. Behr and I would love to see your projects. 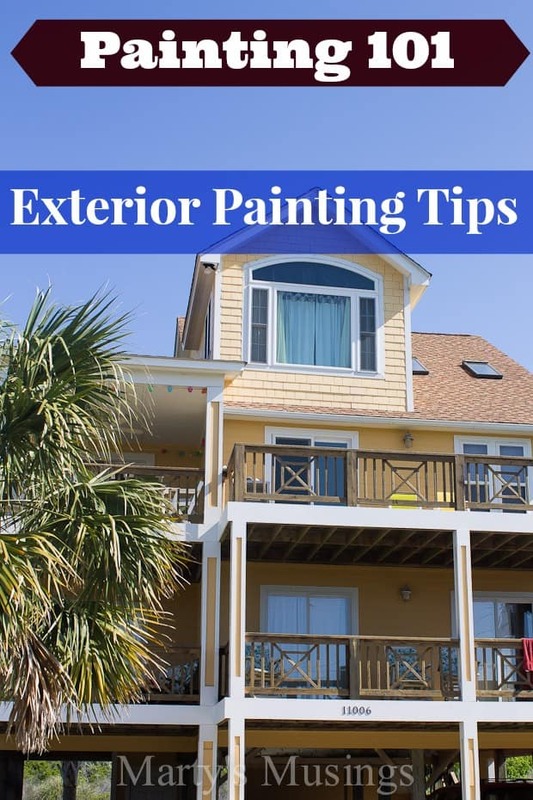 Share them here in the comments or tweet them @BEHRPaint. ***Paint color is BEHR Premium Plus Ultra, Interior Eggshell Enamel, Pewter Mug 770E-3. Yes, your room really does look amazing! I can’t wait to see the finished product! I’m so excited and am so grateful you’re going to help me finish out the room! Love you! We didn’t have any spare income for about 20 years so that’s probably why we didn’t change anything! Plus we had no time with raising 5 kids and homeschooling. Maybe that’s why I’m so excited with the changes! 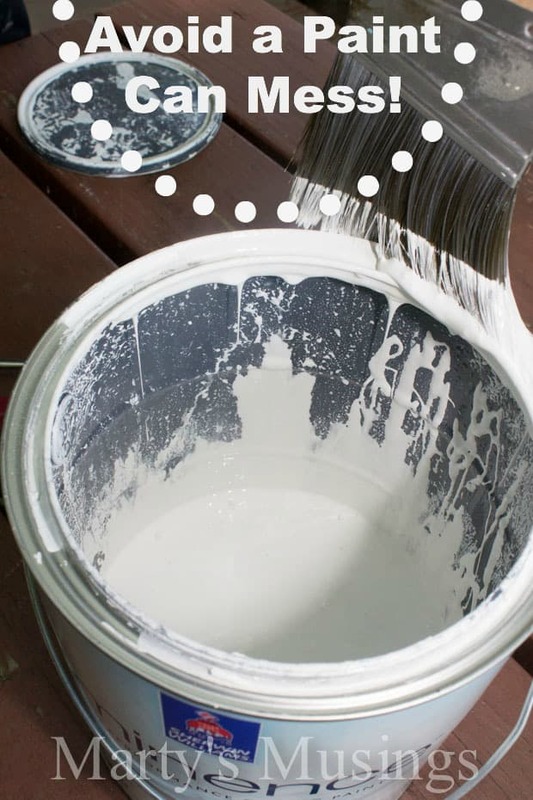 We are big fans of Behr, as well. 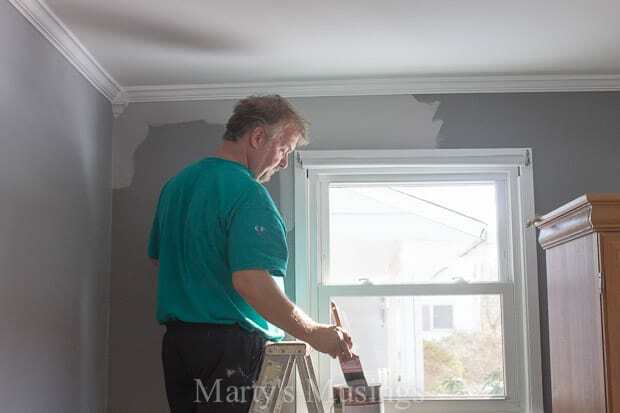 Our last house was painted entirely with Behr, inside AND out! 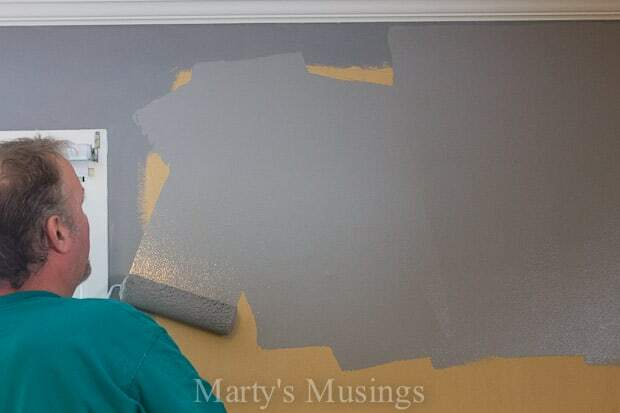 Your gray looks great! We do love Behr, obviously, Kirby. Tim almost always uses them on his jobs unless the client specifies another product. This is a lovely color, what a change! Can’t wait to see what is next. Thanks, Diana! This room has been so much fun to put together, and on just a little bit of money, too! I’ve seen the makeover in person — and it is stunning. Such a wonderful change. And contrary to what Laura commented, I don’t think you guys are going to have any trouble figuring out what to do in there. I’m talking about watching “24,” of course! Girl, we’ve moved past “24” to “The Following.” Although I hear 24 is coming back new and renewed! Hi, Christine. I just went back and highlighted the paint color to make it more accessible. 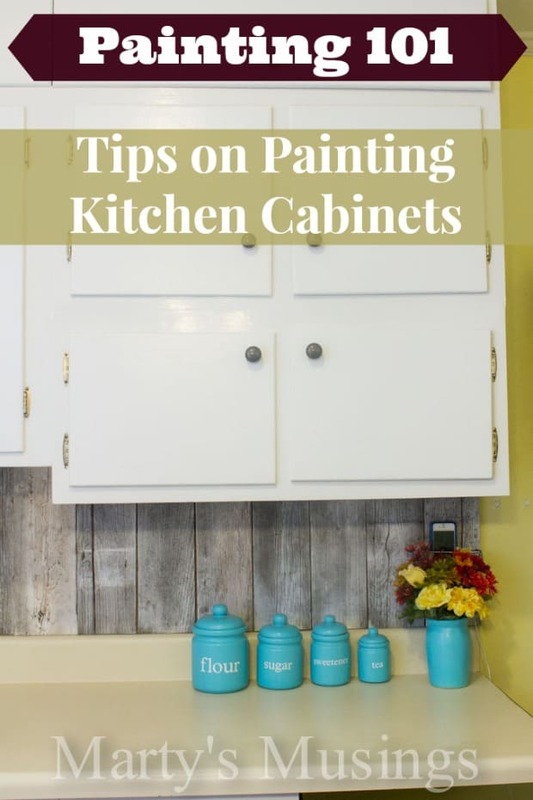 It’s listed at the bottom of the post: Paint color is BEHR Premium Plus Ultra, Interior Eggshell Enamel, Pewter Mug 770E-3. Have a great day! It’s now at the bottom of the post in bold 🙂 Paint color is BEHR Premium Plus Ultra, Interior Eggshell Enamel, Pewter Mug 770E-3. Blessings! What an incredible transformation (and a very patient husband lol)! I’m moving towards gray these days, too. So tired of the tan/gold thing. 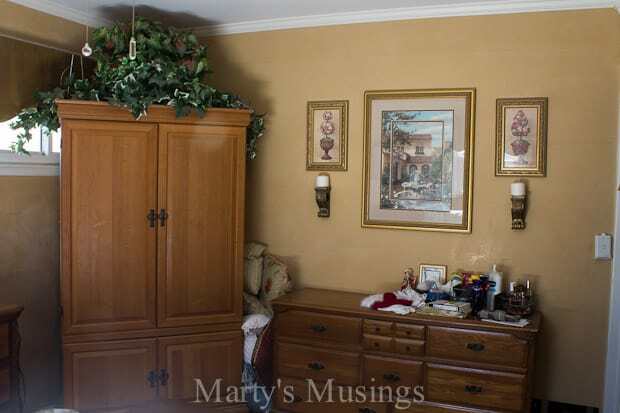 I really love the color that you chose and that dresser make-over is pretty fantastic, too! Hi, Jenna. Thank you so much for the compliment! It’s amazing how the room is changing, mainly with the paint colors. The furniture definitely is amazing! Super choice, I love the color. Thanks for sharing.